Bungalow 1325 is a brand new, beautiful, and versatile space in the heart of the historic Plaza Midwood neighborhood. As conceived by acclaimed photographer Cassandra Bradley of BlueSky Studios and founder of Charlotte Wedding Bosses, it’s the very first of its kind in the entire region. We so enjoyed the pleasure of spending an afternoon in its subtle splendor as well as a chance to chat about the innovative concept for this exclusive feature. The combination of studio, gallery, and bridal suite was created to meet the unique needs of brides in the greater Charlotte area while also serving as a creative hub for top professionals in the local wedding industry. Brides-to-be in the QC now have a place designed specifically with portraiture, primping, and parties in mind. The historic hideaway boasts understated luxury: soft and natural lighting, elegant chandeliers, chic ghost chairs, glamorous mirrored surfaces, pretty throws, and tasteful décor. Blending trendy with traditional, it features several intimate and cozy vignettes that are perfect for bridal, fashion, and boudoir portraiture. Because the rooms within the bungalow were carefully considered and decorated by an interior designer and wedding photographer, expect beautiful photos as a result. Let’s get real: ladies, sometimes size really is everything. Don’t ever settle. Though comparable in cost, Bungalow 1325 measures up at a spacious 1,000+ square feet, making it over two and a half times the size of the average hotel room. This allows for plenty of space in which the entire bridal party may get ready on the big day. Between vendors and bridesmaids, consider just how much stuff you’ll all need to stow: makeup train cases, hair styling equipment, photography gear, garment bags, shoe boxes, gifts, etc. All of these items make the typical hotel room unnavigable – not to mention messy and less than glamorous for pre-ceremony photo-ops and congregation with the gals. 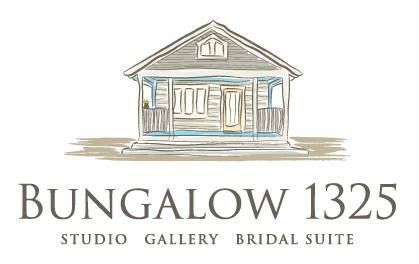 Bungalow 1325 allows the bride to simply show up while necessary vendors, friends, and relatives may come to her. Know that prepping for bridal portraits requires nearly as many errands and just as much coordination as the morning of the actual wedding day. The dress is often pressed just prior and must be brought along with the veil, shoes, and garter. The bouquet must also be picked up or delivered. Finally, there must be one place where the makeup artist and hair stylist both can set up – oftentimes working in tandem to create the perfect look. Many popular bridal portrait and wedding ceremony locations (such as parks, museums, and historic places) do not have a dedicated area in which the bride may comfortably primp and store items. Therein lies the need for this very bridal suite and one central location. And at the bungalow, amenities abound. Take advantage of a fully functioning kitchen and a generously stocked honor bar complete with beer, wine, and champagne. No need to be hangry or resort to choking down a granola bar the morning-of. Simply stroll around the corner for gourmet treats and coffee at Nova’s Bakery or walk down Central Avenue for brunch offerings. Catered meals or food truck visits may even be arranged. Business and pleasure: beyond bridal, the bungalow can also be reserved for small gatherings, workshops, and parties. Relax with family and friends in the petite courtyard – complete with chandelier, twinkle lights, and fire pit. Take a break from it all while basking in the charm of this picturesque neighborhood on one of two day-bed porch swings or rocking chairs. Or, if you’re planning for productivity, reserve the conference areas for a small business retreat.